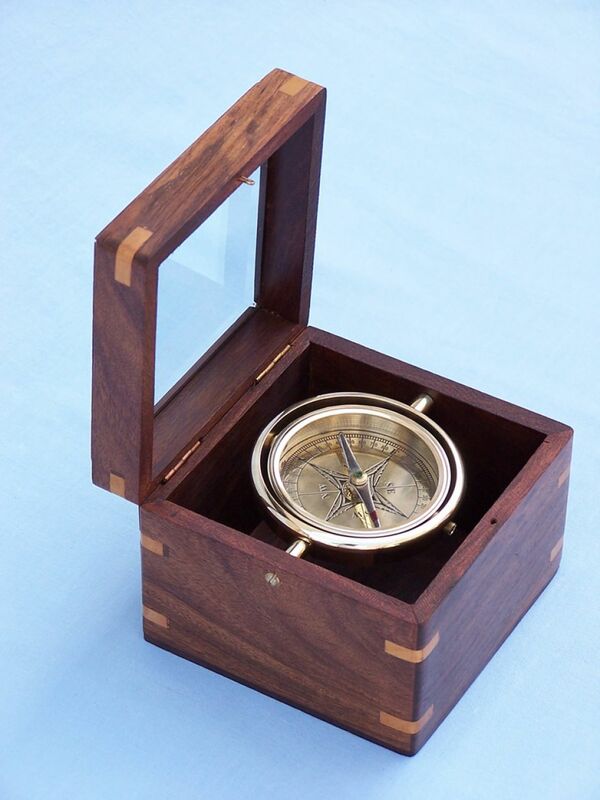 The Hampton Nautical Solid Brass Lifeboat Compass w/ Rosewood Box 5" is a handsome reproduction of an antique brass gimbaled compass in a beautiful brass-inlaid hardwood box. The 2 3/4-inch (7 cm) diameter compass is fully gimbaled with a solid brass gimbal set. 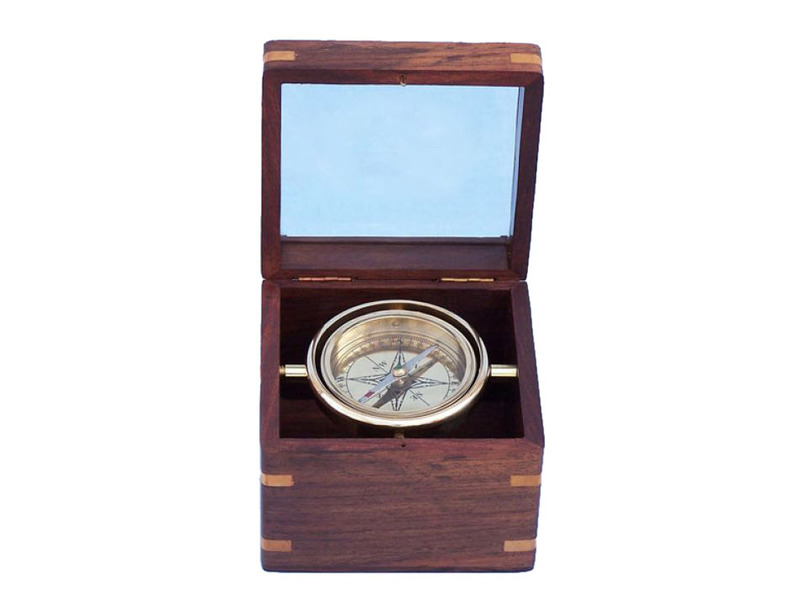 The lid of the hardwood case is inset with beveled glass so the compass can be viewed and used with the box closed, making this a beautiful addition to a nautical collection or executive's desk. The gimbaled compass is also protected by a second glass cover. The case is made from high-quality, smooth-finish, solid rosewood. As exploration expanded and the Industrial Revolution began, further changes were needed aboard ship to ensure accurate travels. 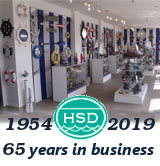 Although ship deviation had been a minor factor with wooden ships, with the introduction of steel and iron hulls it became a problem that could vastly sway a ship’s travels. The solid hulls of these ships could become magnetized, and even with an ideally placed antique brass compass above deck, often the magnetic force caused the nautical compass to point in only one direction. The method of swinging a ship was devised, in which the ship was constantly pointed a slightly new direction along its course, while bearings were compared to stationary celestial bodies in determining the correct reading. The rectangular method of compensation was also developed, in which additional magnets were placed around a vintage brass compass to correct deviation. 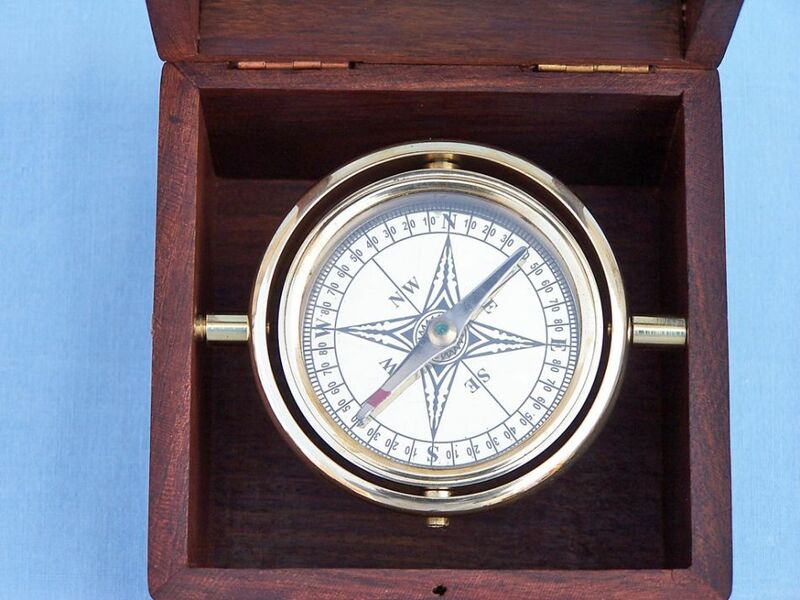 While a ship was headed due North, lead by a second antique brass compass, magnets were placed fore and aft until the primary compass pointed North. Following this, the ship was lead due East while magnets were placed athwartship to create a solid Easterly bearing, then small iron spheres were slowly moved outwardly away from the compass as the ship was lead Northeast. Finally a vertical magnet was placed below the axis of the compass to negate the affect of a ship’s roll, resulting in an antique brass compass that was as balanced as physically possible.